It’s been four days since a CBA agreement has “tentatively” been reached, less than a month from a possible opening day (nearly 2 months behind schedule), and already the NHL has been put on the back burner. Don’t get me wrong, I grew up playing basketball but come from a hockey family, so I try to be as impartial as possible. A few days off and it feels like everyone has forgotten about the Bruins. Maybe it’s just the excitement of the NBA’s sudden rise from the grave, but we can’t forget where the Bruin’s stand. The B’s look to cap off an incredible month of November (11-1) tonight against the Leafs. A win will help them secure first place in the Northeast Division, pushing ahead of Toronto. The B’s have already won twice against the Leafs in the early season, so you can expect them to come out swinging. I’m confident this will be a game the Bruins won’t allow themselves to lose. Not only is first place on the line, but the B’s want to continue to prove that Boston is still a hockey town. There is a reason the Colts are 0-11 this season and it is not all because Peyton Manning got injured. I’m not saying they are a playoff team without him, but they are not an 0-11 team. Tom Brady went down week one of the 2008 season and the Patriots finished 11-5. When you lose you’re All-Pro QB for the full season you are forced to change your offense, not keep it the same as the Colts have this year. The Colts pass/rush ratio is 32.9/22.5. A difference of over 10 more passes than rushes per game. Why would you revolve your team’s offense around the passing game with a quarterback you know can’t throw the ball? In 2008 when Brady got injured the Patriots pass/rush ratio was 33.3/32.1. A difference of just over 1 more passes than rushes each game. When you lose your star quarterback you must change your offense around your other strengths. The Patriots used a running tandem of Sammy Morris, Green-Ellis, Faulk, and LaMont Jordan. You can’t tell me that’s a better tandem than Joseph Addai, Donald Brown, and Delone Carter. We all know the Patriots as a passing team, but in 2008 they were forced to change their strategy and the results showed. When Jim Caldwell gets fired at the end of this season everyone will be saying it was undeserved because Manning was injured, and that certainly is not the case. Although there was much speculation about Chris Paul coming to Boston in place of Rajon Rondo (which would be amazing and anyone who says otherwise does not know what they are talking about), it looks like it will not be happening because Paul knows the age of our team. He will not sign an extension beyond this first year. Besides, there are still rumors floating around that he is making a dream team #2, with Melo and Amare in New York. Keep in mind though, KG said the same thing in ’07, as well as Melo. Hmmm. The Indiana Pacers are also trying to work a deal out to bring Rondo to their team but without a third team involved, Danny Ainge would be foolish to look too far into this. They do not have anyone that can replace Rondo’s athleticism and we cannot rely on Delonte West as a starter (assuming that we re-sign him and he doesn’t get caught with guns on his motorcycle or fornicating Lebron’s mommy). With most of our team entering senior citizen status next season, it will be tough to get any big name player to sign a contract here. Therefore we need to stop remembering the past big 3 for what they were and think about alternative scenarios that could give us the best opportunity to compete with the Big 3 of the Heat, which will be stronger than last year, and the possible Big 3 in New York. 1. Packers (11-0) – Their record speaks for itself. 2. Patriots (8-3) – Their offense is still great and the defense is improving each week. 3. Ravens (8-3) – They shut down the 49ers on Thanksgiving without Ray Lewis. They’ll be even better when he’s back. 4. Saints (8-3) – 49 points against the Giants defense is no fluke. 5. Steelers (8-3) – Big Ben looks good and they’re defense is strong as always. 6. 49ers (9-2) – They hung in there with the Ravens. Their shaky offense is why they are here. 7. Cowboys (7-4) – If they played up to their talent level they could be in the top 5. 8. Lions (7-4) – They still have Megatron and a solid defense. If they can survive without Suh the next two weeks they should make the playoffs. 9. Giants (6-5) – Similar to the Cowboys. Still have a great pass rush and a solid offense. 10. Falcons (7-4) – Their offense is getting better. 11. Raiders (7-4) – Palmer looks great and Bush has helped them miss McFadden a little less. 12. Jets (6-5) – They still have Rex Ryan, but to counter that they also still have Mark Sanchez. 13. Bengals (7-4) – The rookie combination on offense continues to shine, the defense looks solid also. Unfortunately they have to play the Ravens and Steelers twice each season. 14. Broncos (6-5) – One name is all you need to know. Tim Tebow, he’s a winner. 15. Bears (7-4) – We saw what Caleb Hanie could do. It reflects in this weeks ranking. 16. Texans (7-4) – Now officially the worst 7-4 team in the league. Who is the QB in Houston again? 17. Titans (6-5) – If Chris Johnson can play like he did last week, they have a solid playoff shot. 18. Eagles (4-7) – The best 4-7 dream team in NFL history. 19. Chargers (4-7) – My bet is Norv Turner won’t be living in San Diego next season. 20. Redskins (4-7) – Teams don’t make the playoffs with quarterbacks like John Beck and Rex Grossman. 21. Bills (5-6) – They have completely fallen apart and have basically no shot at the playoffs. 22. Buccaneers (4-7) – Josh Freeman has had an off year, and so has a lot of the team. 23. Seahawks (4-7) – Similar to the Washington situation, you usually don’t make the playoffs with QB’s like Jackson and Whitehurst. 24. Dolphins (3-8) – They look like they are turning around, its a little too late though. 25. Cardinals (4-7) – Same as many other teams in the NFL, Kevin Kolb doesn’t look like the solution. 26. Panthers (3-8) – Imagine if they didn’t have Cam Newton? 27. Vikings (2-9) – Hey at least they’ll probably have a top 5 pick. 28. Browns (4-7) – Their offense is just terrible. 29. Jaguars (3-8) – I’ve been surprised Jack Del Rio lasted this long. 30. Rams (2-9) – What a disappointing year for Sam Bradford. 31. Chiefs (4-7) – Tyler Palko just isn’t gonna cut it. 32. Colts (0-11) – Doesn’t get any worse. Alright, let me start this post out by saying that this is not my prediction for the Superbowl. As good as both teams are, I just don’t see them getting past some of the more balanced teams in the league. With that being said, I would love to see this matchup come February because it has the ingredients to create one of the most delicious offensive showdowns in history. 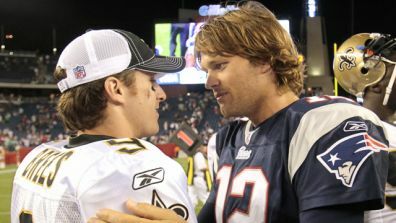 Looking at the figureheads of both squads, Brady and Brees, these guys are out of their minds this year. With both teams really using their entire wide-receiving core because each team lacks a Randy Moss / Calvin Johnson like superstar, it is truly incredible that these guys are both (yes, both) on pace to break the record for yards in a season. It’s a testament to their preparation and dedication to the game (if you watched the post-game last night, you could see Steve Young draw full as he described Brees). With that being said, this Superbowl matchup would be an all out slugfest. I legit think the over-under might be 409. With neither team possessing much of a secondary, players like Sproles and the super tight-end that is Gronkandez stepping up, the offensive display will be a masterpiece. Watching two of the best in the history of the game battle it out is something that I am undoubtedly looking forward to. That is unless Rogers continues to perform the same way he has in the last 11 games. In which case it will go down as the greatest QB performance ever (yes, even better than ’08 Brady). It is nice to see a man accept what is happening and believe in the process rather than just sticking with his friend of so many years. 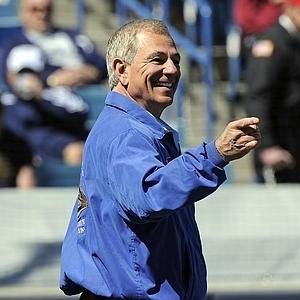 Hopefully it all works out and we find out that he didn’t fiddle with those ball boys. 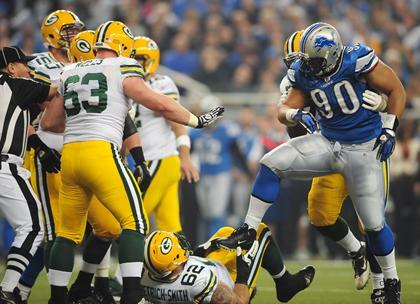 Ndamukong Suh of the Detroits Lions has been suspended for two games without pay for his decision to stomp on a Packers player during the Thanksgiving game this Thursday. I don’t agree with many of Roger Goodells decisions but this is something that needed to be done. Suh’s suspension will cost him $164,000 and potentially cost his team a victory while in the running for a playoff spot for the first time since 1999. Following the game Suh insisted it was unintentional, but then days later proceeded to call commissioner Goodell to apologize. What is there to apologize for if what you did was “unintentional”? The best thing Suh could have done was publicly apologize to his fans and teammates for getting ejected in such an important game and at the time potentially facing a suspension that could cost his team a playoff spot. Maybe this will make him learn? I doubt it.